Continuing the journey through the Hill Cantons, we arrive at book number three: Misty Isles of the Eld. This book is interesting for a number of reasons! 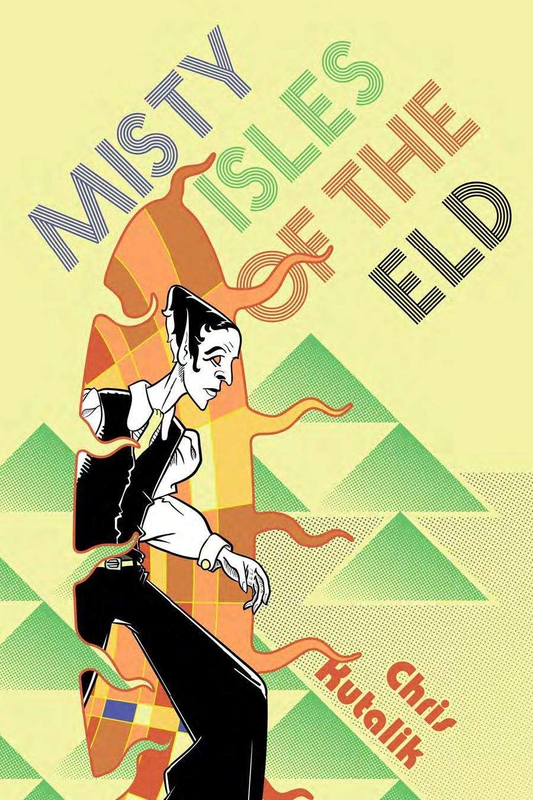 Misty Isles of the Eld is an adventure sandbox set in the heavily magical, strange space across a sea channel from the Slumbering Ursine Dunes (book one in the series) where the Cold Hell has broken through the wilderness of the Hill Cantons. Here, the cruel and alien Eld reign supreme; theirs is a bizarre place where technology and biology mix in horrific ways. The Eld are pale, lithe humanoids with ovaloid skulls and pointy ears, like a horror movie version of elves crossed with grey aliens. They enslave human children and raise them to be devoted servitors, and relegate the weak to a terrible fate as mutated Vatmen. Their islands are unnatural places, supplanting the natural world through sheer reality-bending magic, and they are surrounded by an equally unnatural fog that makes navigation extraordinarily difficult. The book contains a number of adventure sites, including a complete dungeon. Artistically, this book may be the strongest of the bunch. Art being subjective, I can only speak for my own preferences, but I will attempt to lay out what I mean. While the art on both Slumbering Ursine Dunes and Fever-Dreaming Marlinko is very good (especially FDM), both have weaknesses. In my estimation, while Slumbering Ursine Dunes is well-served by having one dedicated artist, it suffers from the slightly indistinct style common to digital painting. Fever-Dreaming Marlinko has several talented artists working together and putting out some of the individually strongest pieces in all of indie D&D, but the variation makes you wonder about the intended tone at times. In contrast, Misty Isles of the Eld has just one artist - Luka Rejec, in his very first large project - and that art is incredibly stylish and sharp. It is the Eld. The lineart from Luka Rejec is clean and visually interesting, and often quite bizarre. It evokes a sort of ancient aliens feel as often as it conjures the feeling of watching Heavy Metal: The Movie. The Eld being inherently artistic, colorful, stylized creatures by nature (and their islands being bizarre places outside of normalcy), this is eminently suitable to the material at hand. Because of this, I believe Misty Isles of the Eld has the strongest art in the series so far, on the whole. As for the layout of this book, it continues with a largely single-column structure, similar to that found in the prior two books. However, much as Fever-Dreaming Marlinko represents an iterative improvement in layout over Slumbering Ursine Dunes, Misty Isles of the Eld is again a step forward. More interesting placement of art is found throughout the book, often better arranged with statblocks and useful text. Key items and tables are clearly defined and often placed in handy spreads. Still, the single-column design and lack of dedicated spread layout leads to a lot of page-flipping when dealing with the adventure sites/dungeons. Overall, the layout is the best so far in the series, and shows a distinct trend of lessons learned. The adventure components of Misty Isles of the Eld are a little different from previous entries. Whereas prior books had two major, detailed adventure sites, this book has four. One of these is a fully-realized larger dungeon complete with detailed maps. These are connected, in classic Hydra Cooperative fashion, by a large pointcrawl map full of interesting sites and sights. It is no surprise, then, with this increase in table-ready content that Misty Isles of the Eld is the largest Hill Cantons book so far by a significant margin. The adventure sites in Eld may be the best overall so far in the series, with all of them contributing to the ongoing discovery of the nature of the cruel, ghastly Eld and their incursion. Players who explore the island in full and interact with all the pregenerated sites will slowly uncover the lore of the Eld. Some of the sites are actually quite horrific and raise lots of questions about the inhumanity of these strange beings from beyond this realm. As I've said, they are inherently scary, threatening, artistic, colorful, fancy, inhuman, alien creatures, and the adventure sites are really where these concepts truly shine. Along these lines, overall the point of the book is largely to explore the island, take their treasures (naturally!) and eliminate the Eld. By killing off the Eld, their otherworldly grasp on this chunk of the lands of Zem is shaken and will, over time, allow the islands to revert back to normal and reject the incursion of the Cold Hell. This differs from many OSR modules, in that often in old school gaming it is by far preferable to avoid as much combat as possible. Here, elimination of the entire Eld contingent is presumed to be a goal of the players; while Chris Kutalik makes note of the usefulness of the book's adventure sites stripped of the isles and the Eld in general, the reality is that you've probably purchased this book to play through as laid out. This doesn't mean the book rewards a modern play style and the expectation of balanced encounters with little danger of death; numerous areas are designed intentionally to be incredibly dangerous even to well-equipped parties of sufficient number and level, and tactical thinking is necessary to survive the deadly odds of the islands. Of course, the Eld are not content to sit back and let the PCs maraud upon their islands. The actions undertaken by the PCs cause various levels of alert within the Eld military forces, leading to various increases in Eld activity. At different levels the behavior of the entire population of the Eld changes, leading to increased and decreased interactions, more desperate behavior, and so on. The command of the Eld falls to numerous named ranking NPCs who are capable of calling for a limited number of reinforcements to spite the PCs and hold on to a tenuous grasp of the islands, leading to a dangerous game of attrition. The book is filled with interesting tables. Everything from where and how you land on the shores of the islands themselves (no mean feat!) to the types and numbers of reinforcements can be found on useful tables throughout the book. Naturally, the usual suspects, such as encounters and patrols, are found on tables as well. In previous Hill Cantons books, a Chaos Index was present to model the dynamic Weird, the layer of magic that blankets and warps areas of the world of Zem. In this book, an Anti-Chaos Index exists, because the isles of the Eld are trapped in an unnatural state by the incursion of the Eld and the Cold Hell. This index is impacted by character actions only, and successes (or failures) of the party can push the index back towards normality. As the party progresses in defeating the Eld, the real world reasserts itself, making the landmass more reasonable and rational, and reconnecting it to the rest of the natural Hill Cantons. As usual, Chris ends the book with a terrific bestiary and new class options. This time around the class is a variant cleric-wizard psionicist with bizarre mutations due to exposure to Eld radiation, which is cool as hell. This includes a wicked table of mutations which, honestly, is extremely useful in all kinds of ways if you play a dangerous style of D&D where magic can backfire or potions/cursed items/etc can result in permanent weirdness. Great stuff. In prior books Chris gave us two classes; in this book, he swaps one class for a huge library of psionic "spells" for the Psychonaut class and a big list of potent and strange Eld artifacts that can utterly change the tone and landscape of your game. Overall, this is an immense amount of gameable content that can be adapted to anything you're doing (such as dropping the Misty Isles into your own setting, for example). At the end, and further proof of iterative advancement in layout design, the maps featured earlier in the book are reprinted for easy reproduction or reference. I wish it had included a table index as well, but you can't win them all, I suppose. Misty Isles of the Eld was actually the first of the Hill Cantons books that I read. It was recommended to me by a Twitter user named @oxfordgamer when I asked what recent OSR-ish adventures folks would recommend to introduce folks to the game style. As I had only recently emerged from avoiding most internet RPG stuff after leaving years ago from sheer 3.5E/4E war negativity exhaustion, I had never heard of the Hill Cantons, Chris Kutalik, or Luka Rejec. I had managed to stay abreast of some OSR/DIY darlings - I knew about Labyrinth Lord and OSRIC and Lamentations of the Flame Princess, for example - but I had clearly missed out on so much. I was therefore very excited to grab Misty Isles of the Eld on @oxfordgamer's recommendation. It ended up opening whole new doors to me. Update 20 Mar 2019: A new n/10 rating system has been instituted to more clearly express my feelings. The legacy n/5 system was always supposed to represent the top half of the n/10 system as I really only review books I really enjoyed in the first place (so they'd all be 6/10 or better) but under that n/5 system, a 1/5 is actually still a very good book, but this is not clear to casual observers. For this reason, the new n/10 system is being used going forward, and is being ported backwards to old reviews. The corrected n/10 value for this review is immediately below this update text. Following that, the original review text is unaltered. A detailed post on this subject is forthcoming. With all the little improvements over the prior books, far more content, and no shortage in wild and interesting elements, this book is another easy recommendation from me. I give Misty Isles of the Eld five babbling psionic possums out of five without any hesitation. Fever-Dreaming Marlinko was a big step up over Slumbering Ursine Dunes, and Misty Isles of the Eld is another move in the right direction; this book cemented my interest in Hill Cantons and also made me an instant fan of Chris Kutalik, Hydra Cooperative, and Luka Rejec. Do not hesitate to grab this book even if you are unsure of where the other two would slot into your existing campaign - this can be made to work with ease in any world. As always, I am happy to hear from all y'all out there about your thoughts on this book or my meandering, verbose reviews. Hit me up in the comments or over on Twitter @dungeonspossums. The home of ramblings, roll tables, and shoddy art made by a fan of trash animals. Old school D&D, OSR, 5th Edition, and various other things can find a home here. Eat trash! Be free! Become a Patron! Feed Me Premium Cat Food on Ko-Fi! You can help support this blog by clicking these banners (or many of the links in my articles) and making your purchases with my affiliate partners. Each purchase through these affiliate links provides me with a tiny commission which feeds my crippling addiction to dead tree and digital media. All proceeds will be put back into RPG products for me to review on this site, and therefore back into the hands of RPG creators. 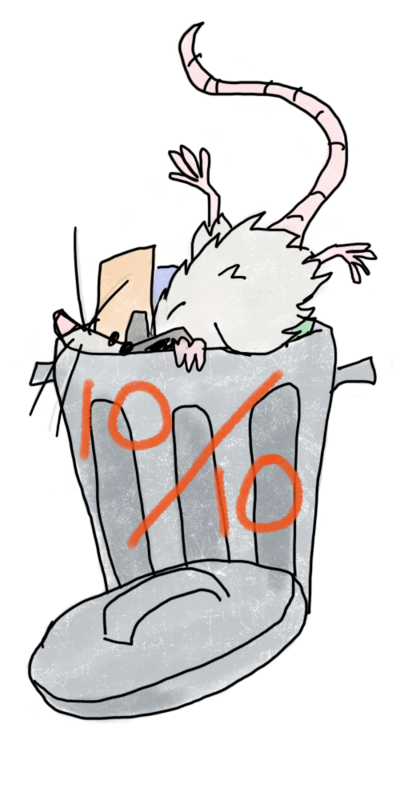 My affiliate commission comes out of the store's percentage; it does not raise your cost or take a single cent away from the creator. Everybody wins. Please consider using these affiliate links. Thank you! Ynn episode 2 - The fall of Alfonso.